Video VBOX Lite is one of the lowest costing Video Data Loggers on the market, but with Racelogic's quality and renowned customer service. 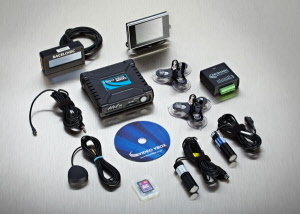 The new HD system offers the highest quality and ease of use. As a Caterham specialist, we provide all the additional parts and advice required for installation for use in a Caterham. Where we carry out the install, we provide a Caterham specific configuration. With our own hot lap benchmarks we are able to advise on where those crucial lap time gains can be found. 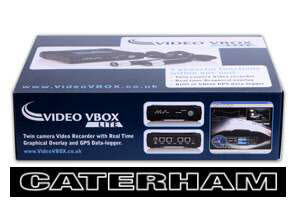 Video VBOX contains the multi-cameras video recorder, VBOX GPS data-logger and the real-time graphics overlay, all in one small, reliable package. No other system on the market currently achieves all of these goals. The videos recorded by Video VBOX are in a standard .avi format, meaning that they can be played in Windows Media Player (some PC's may require the free xvid codec), VLC player, or any other standard media player. They can also be uploaded directly to YouTube without any kind of conversion. The optional OLED display can now do Predictive Lap-timing, so not only can you get in-car lap-timing information, but you can now see a continuous comparison of the current lap against your previous best. Rather than distance, it uses GPS position to accurately align two different laps, 10 times a second. This offers unrivalled accuracy, even if the driver takes a completely different line each lap. The system will maintain 0.1 second precision the entire way around any circuit, including very long circuits such as the Nurburgring or Spa. Many features have been built into the Video VBOX during the design to enhance the quality of the cameras, video and graphics. MPEG-4 compression was used to gain the best balance between quality and bandwidth and uses about half the storage space as MPEG-2 for the same quality. The new HD system offers the highest quality with much improved ease of use such as a smart phone/tablet option for adjusting and checking camera angles.